I love floral prints but not all floral prints are created equal! Some floral prints are just okay, while others seem to have that certain "wow" factor. This floral skirt from J. Crew featuring a print from their Liberty collection definitely has a "wow" factor, mostly due, I think, to the exquisite color palate that is used for the flowers. (There's also butterflies on the print!) I purchased this skirt recently at J. Crew during one of their promos on full priced items and I am happy to say, at least for the sake of my readers, that it's now on sale! Since this floral pattern is also featured on a shirt and a dress, I'm now tempted to get all three because that's how much I adore the print! One of my favorite things to do with a floral print is pattern mixing. Lately, I have been loving the gingham and floral combo that, I think, is very reminiscent of J. Crew circa ten years ago. It's a way to make the floral print really come alive, in my opinion, and also a way to have some fun with the print! Since I am dedicating this post to floral prints, I would be remiss not to point out that I have been really enjoying all of the real life flowers in the Southern California area lately. For those of you who have been keeping up with my blog and Instagram, you probably will have noticed that I've hit all of the super bloom locations in the area from the poppy fields to the desert flowers; Los Angeles has never looked lovelier! Even on the freeway, there are flowers galore! 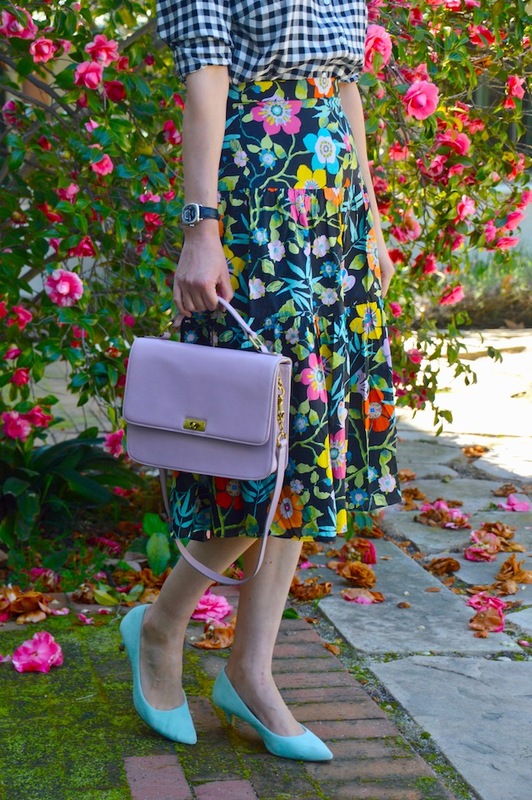 So, yes, it's the perfect time to wear a floral skirt and to take in some real flowers! This floral skirts definitely has a "wow" factor! It's giving me all the Spring feels. Love, love, love the print! I'm with you - I thought the JCrew print was gorgeous and I love the way you've mixed it up! Love that pattern mixing! that skirt is gorgeous! That's certainly a wow print! Love this! love how you mixed print. That is a beautiful skirt...love the vintage vibe. You look like a movie star!!!!!!!!!! 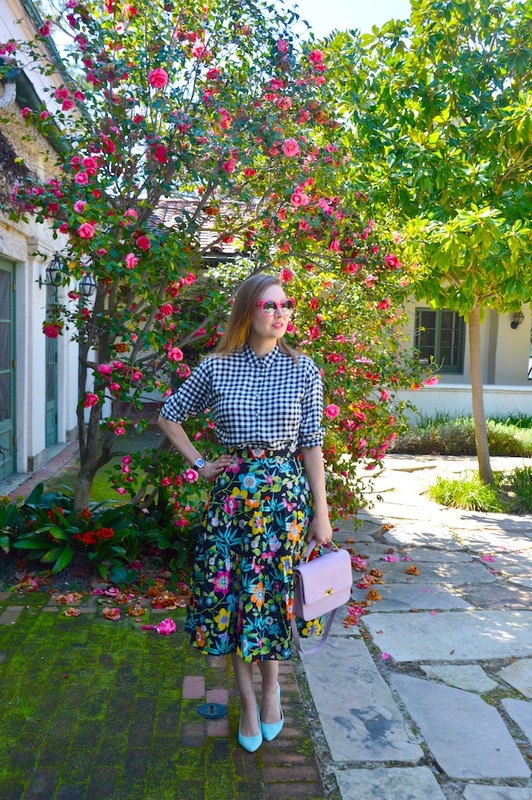 That floral and gingham patterns are perfect for spring! This skirt belongs in your closet with its pretty & bright print! Beautiful pictures ! I love the mix of gingham and florals, and your Springy pastels are perfect with your shoes and adorable bag! That's a beautiful floral print skirt and it looks amazing with the gingham shirt! I love your shoes and bag too! Thanks for linking up!